Excerpts from today’s Sunday Star Times. According to a Ministry of Health report – “Regulations governing the control of novel psychoactive drugs” – outlining what testing would be needed under the law change, a designer drug “must” go through pre-clinical animals studies and it is “critical” to show a drug is safe for animals before it can be given to humans. “At the study’s completion, animals are sacrificed and tissues from all organ systems examined,” the paper said. Associate Health Minister Peter Dunne said that despite a public consultation process, it was “unavoidable” that party pills would be tested on animals – including dogs. “The Government is committed to minimal use of animal testing, but the hard truth is that scientifically, animal testing is unavoidable to prove that products are safe for human beings,” Dunne told the Star-Times. “It is an unpleasant but necessary reality. “Animal welfare advocates called on New Zealanders to fight the proposed animal testing. Green Party MP Mojo Mathers said: “I think it is barbaric. 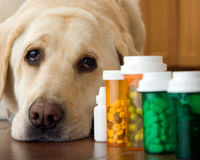 Dogs and other animals shouldn’t be made to suffer just so that we can get legal highs on store shelves. “I really encourage people who feel that testing of party pills on dogs and other animals is unethical to speak out against this proposal. Animal testing is cruel and it’s not justifiable for party pills. “Anyone who owns a dog will know that they are intelligent, affectionate animals capable of great loyalty and trust to humans,” she said. Green Party MP Mojo Mathers is quite right. Peter Dunne is totally unethical. In my opinion, he’s not fit to be an MP. In my considered opinion, he’s hardly fit to be a human being. Now for the backdown—which, really, only makes things look worse for the unpleasant and unnecessary Peter Dunne. LATEST: Peter Dunne has ruled out using a “barbaric and disgusting” method which would force animals to take lethal doses of party pills to ensure they’re safe for human use. 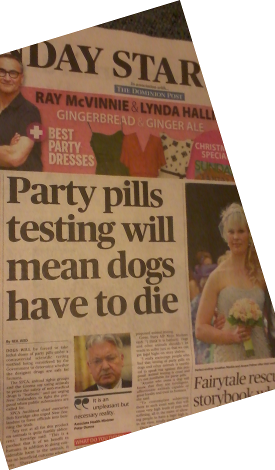 The Associate Health Minister initially told the Sunday Star-Times it was “unavoidable” that party pills would be tested on animals, including dogs. Funny how something that is “necessary” and “unavoidable” can suddenly be labelled “barbaric and disgusting” and be “ruled out” within hours of a headline that’s a bad look for the Associate Minister of Health. 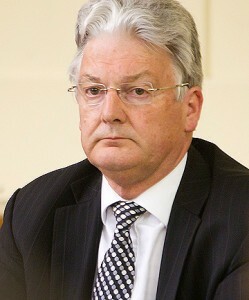 The only thing that would-be dog poisoner Peter Dunne really thinks is necessary is his re-election. Just legalise recreational drugs, Peter Dunne—starting with cannabis. This miracle herb has already been fully tested by humans and guess what? No one has ever died from a cannabis overdose. No LD50 has ever been established. What is your stance on animal rights Richard? Callum, gratuitous cruelty to non-human animals is morally wrong. Does that answer your question? Do you believe that that principle should be enshrined in law, through legislation specifically banning such cruelty toward animals?